For years, scientists have puzzled over an anomalous feature in radar imagery of Ligeia Mare, a hydrocarbon-filled lake on the Saturnian moon Titan. A bright, seemingly solid spot appeared out of nowhere in July 2013, in an image from the Cassini orbiter's Synthetic Aperture Radar — but it failed to show up during subsequent flybys. That led some scientists to nickname the feature "Magic Island." Now a fresh radar image suggests that Magic Island is reappearing, bigger than ever. "Science loves a mystery, and with this enigmatic feature, we have a thrilling example of ongoing change on Titan," Stephen Wall, deputy leader for Cassini's radar team, said Monday in a news release from NASA's Jet Propulsion Laboratory. Titan is mysterious enough, even without Magic Island — which scientists stress is almost certainly not an island. Titan is the only moon in the solar system that has an hazy, opaque atmosphere. It's so cold that methane and ethane exist in liquid form — and those hydrocarbons are apparently circulated through lakes, rivers and "rain" clouds, just like water on Earth. 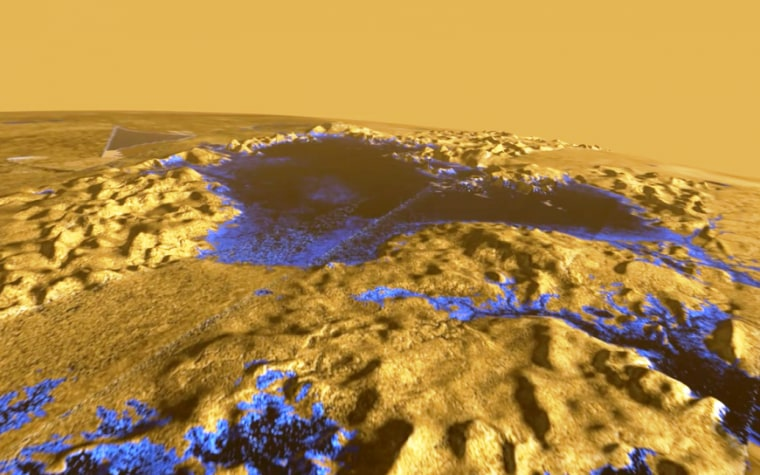 Scientists have been using Cassini's infrared-sensitive camera and radar imager to keep track of Titan's lakes and rivers for more than a decade. So when a fresh batch of radar maps came down last year, Cornell University's Jason Hofgartner and his colleagues flipped between the old and new pictures, watching carefully for any changes. The anomalous spot came as a big surprise. If it were an island, it would be about 30 square miles (75 square kilometers) in area — in other words, a few square miles bigger than Manhattan. The team was looking forward to tracking Magic Island's development, but follow-up imagery showed no further signs of the anomaly. Until last month. That's when the radar images revealed a fuzzy feature where Magic Island had been. The latest manifestation of the anomalous spot isn't quite as bright, but it looks roughly twice as big. The feature's reappearance serves as evidence that whatever Hofgartner and his colleagues saw last year wasn't a fluke. But what is it? Hofgartner told NBC News there are four leading hypotheses: The feature could be the radar reflections of surface waves on the lake; or bubbles of gas rising out of the lake; or something solid that comes up to the surface; or suspended solids that accumulate like silt and then dissipate. The phenomenon may have something to do with seasonal changes on Titan, which is nearing northern summer. If they're waves, they may appear only when Titan's winds kick up in a particular direction, Hofgartner said. Seasons move slowly in the Saturnian system, where each year lasts 30 of Earth's years. But scientists hope enough observations will be made to determine which of the four hypotheses provides the best explanation, or whether they'll have to go with a more exotic explanation. Like breaching Titanian whales, for example? That hypothesis is not on Hofgartner's list. Nevertheless, solving the mystery could carry astrobiological implications. Titan has long been seen as a possible analog for ancient Earth, and perhaps Magic Island hints at the shape of things to come. "There's no reason to suspect this is a signal for biology," Hofgartner said. "But in general, more energetic processes may enhance the suitability for life on Titan."